If you do research on auto insurance plans, you might see some unusual terminology like “admitted” and also “non-admitted” companies. These two types of firms have several differences, but the core ones are state-imposed regulations that must be complied with. To put it simply, an admitted auto insurance carrier has complied with the state’s regulations for licensing. This includes publishing their car insurance rates and getting them accepted by the governing body. This is important to consider because insurers that are admitted by their state are fully backed by the insurance guaranty fund of the respective state. This gives an added level of protection to consumers who purchase policies from admitted providers. In a worse case scenario, such as a bankruptcy or insolvency, the state will take control over the insurer’s assets and in most instances, will sell them to cover the pending liabilities. If the insolvents firms assets are insufficient to cover the liabilities, the state guaranty fund will step in and cover them. This will include of course pending claims and all carry over premiums. Find the best-admitted auto insurers with a free quote from goodtogoinsurance online. With a “non admitted” auto insurance company, which is also called a surplus lines carrier, they may not have a specific license with every state that they sell insurance in. However, they are licensed in the original state where they were originally licensed. 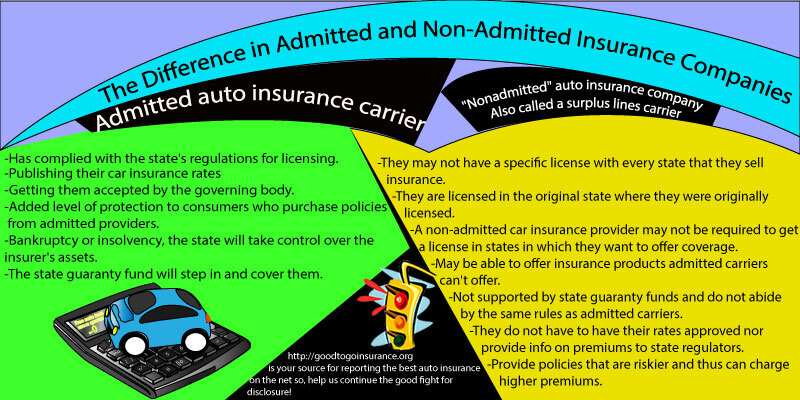 A non-admitted car insurance provider may not be required to get a license in states in which they want to offer coverage, but they must be required to register in each state at the appropriate department of insurance. A non-admitted carrier may be able to offer insurance products admitted carriers can’t offer. The drawback is less financial backing, should the company become insolvent. These types of insurers are not supported by state guaranty funds and do not abide by the same rules as admitted carriers. They do not have to have their rates approved nor provide info on premiums to state regulators. A non-admitted carrier often will provide policies that are riskier and thus can charge higher premiums. This can include customers who need SR-22 coverage or who businesses that need specialized commercial coverage. At first glance, it might seem like a risky move to get a policy with an insurer that is not fully approved or has a license in the state you are getting covered in. However, some people need insurance that is specialized in nature and these types of companies fill that void. Auto insurance is a huge market and there are many market segments. Admitted firms usually focus on what is referred to as the standard market. This market includes normal consumers that need basic car insurance coverage, including home, health, and life insurance. These customers are less risky and most companies market to standard customers. Consumers who are riskier to insure cannot usually find coverage with a standard admitted insurer. This is where a surplus lines companies can come in and fill the void. This market is targeted for these risks. Commercial liability coverage is a big market that many smaller firms specialize in. It can include moving valuable artwork or vehicles statewide. It can also cover those big oil and chemical trucks that you see on the highways. Even though it makes sense from a risk standpoint to try and get insured with an admitted company, it is not always an option. There are quality non-admitted insurance providers that have been in business for decades and are in great financial shape. What you can do is check each insurer’s financial health at rating firms like A.M. Best. Do not buy a policy with and firm that has a C or lower rating. Now that you know the difference between admitted and non-admitted insurance carriers, it’s time to get a cheap policy online. With good to go insurance, you can save hundreds with low direct rates. Apply now for coverage and save more today.